On the southern coast of Lake Garda, on a long and thin peninsula that divides the gulfs of Desenzano in the east and Peschiera in the west, Sirmione relishes in fame thanks to writers like Catullo, Stendhal, Lawrence, and Goethe, who celebrated the town’s environmental and artistic beauty in their works. 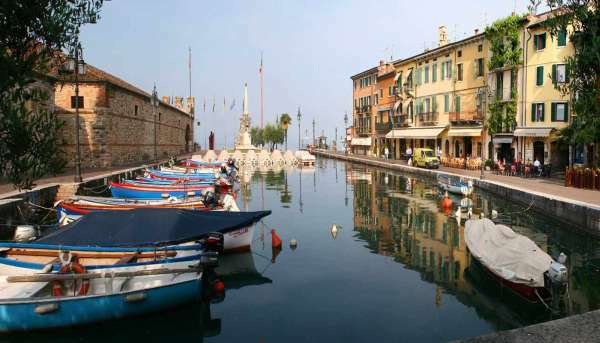 Sirmione is a peninsula rich in history, and it still conserves many of its antique elements. 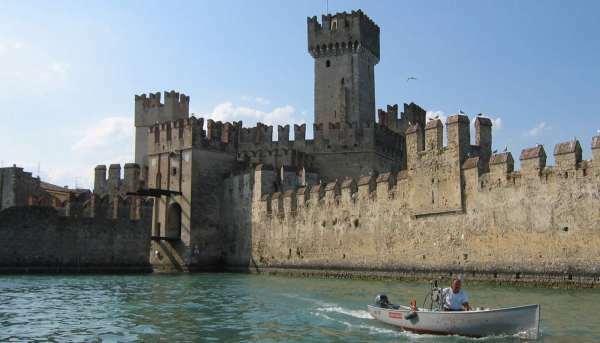 Thanks to its favourable natural position, Sirmione has been a preferred settlement since ancient times. Thanks to Catullo Sirmione is known by all as “the pearl of islands and peninsulas”, and it is a place renowned for the healing properties of its thermal water. Sirmione, whose name comes from “syrma” (“tail” or “dress train”) has developed on a thin peninsula that extends 4km in the heart of Lake Garda, whose natural traits have represented an element of admiration and fame since ancient times. The beauty of its scenery has inspired and fascinated numerous artists, to the point of earning the nickname “peninsula of poets”. Some of these poets were the great latin poet Catullo, who spoke of the “Venusta Sirmio”, Giosuè Carducci, in the “Ode Barbara”, Ezra Pound, a young american poet who in the 900’s met his friend James Joyce in Sirmione, in “The Study in Aesthetics”, and many more. After the fall of the Western Roman Empire, it was known as “Mansio” (a group of buildings submit to a decurion). Sirmione later became part of the Longobard Kingdom and, during the 12th century, had a proper administration dependant on Verona. During the Scaligera Lordship, in the 13th century, it was enclosed by walls and the imposing fortress was built, before its management was passed onto Venice in the 15th Century. Today Sirmione is one of the most important tourist hubs on Lake Garda and has a remarkable network of highly qualified hotels, capable of satisfying the most demanding requests. Aside from being one of the most important touristic places on Lake Garda, since it houses an international-level thermal centre, it holds a rich historic and artistic heritage, that includes the remains of an ancient roman villa of the first imperial age, also known as Catullo’s Grottos. Other important historical places are the Scaligero Castle and the church of Saint Pietro in Mavino, that dates back to the 8th century. The historical town centre is characterised by its thin alleys with stone walls, capable of gifting visitors romantic and fascinating glimpses. The sport and recreational facilities are also very well equipped for water sports (windsurfing, sailing, etc.) and the hotels are of high international standards and are able to satisfy the most demanding clientele. Guests in Sirmione can enjoy all the alternatives the territory offers: not only the hot springs, whose curative properties have been known since ancient times, but also the beauty of the natural parks of Mount Baldo and of the Alto Garda Bresciano. Walk of the Muses up to Lido delle Bionde. During the circumnavigation of the peninsula we’ll be able to see bubbles surfacing from the depths of the lake who take the name of the Boiola Spring. Everything started in 1889, when a venetian diver called Procopio, equipped with a diving suit and special pumps imported especially from England, dove in Lake Garda, and at a depth of 20 metres, near Catullo’s Grottos in Sirmione found the hot water spring, the Boiola. Nobody had been there before despite the fact that the spring was already known for 3 centuries. After several attempts, Procopio managed to embed a long conduit in the rocky layer, where a gush of sulphuric water emerged 5 meters above the level of the lake. The endeavour was clamorous, but it was only the beginning of a long and delicate work of channelling over 300 metres of metal tubes. Finally, the precious thermal water was conducted to Sirmione, and in 1900 the first thermal establishment was built. At the old Boiola spring, after the perforation of two more wells, two sources with thermal mineral water with the same chemical, physical, and therapeutical properties as the Boiola spring were added. A conductor system brings the thermal mineral water to the Valerio Catullo establishment site in the town centre and in the thermal wings of hotels and at the Virgilio Establishment, inaugurated in 1987, a site at the feet of the peninsula. The water of Sirmione is of meteoric origin and, before gushing from the Boiola spring, follows a long path in over 20 years. It is born in the basin of Mount Baldo, over 800 metres high, and falls down for more than 2100 metres below sea level, where it is enriched with minerals and raises its temperature to 69°C. Finally it pours into the Boiola spring, where a complex system of metal tubes channels it into two wells, Catullo and Virgilio, both on the eastern side of Sirmione. The water of the hot springs of Sirmione is categorised as mineral and hyperthermal water, since arose bacteriologically pure, with a fixed residue more than 0,50g/l (precisely it is 2,542g/l) and emerges at a temperature of 69°C. The mineral waters are unique since they only exist and nature and are practically unreproducible. Such attempts have, in fact, demonstrated that artificial mineral waters present different biological activity than the natural ones. Based on its chemical-physical characteristics, the water of Sirmione is categorised as bromine-iodine: it contains in fact a relevant amount of sulphur, in the form of hydrogen sulphide, sodium, bromine, and iodine. The trace elements present (lithium, potassium, iron, arsenic, cadmium, chromium, nickel, selenium, and zinc) all function as catalysts and thus activate chemical reactions. Medical literature shows a peculiar attention for sulphuric and bromine-iodine waters, so we know their biological actions well. Generally, thermal waters determine both a local action and an action on the entire organism (tonic-sedative action on the endocrine system, antiallergenic, and the metabolism). The water of Sirmione has revealed itself as healthy for the absorption of sulphur through the skin and the tropism for articular cartilages, the mucus of the respiratory tracts, the average ear and the vaginal mucus. Furthermore it stimulates the parasympathetic nervous system, with an increase of the vasal permeability and a reduction of the systemic arterial pressure.